Good things are happening in Riverview, New Brunswick. This small community located outside of Moncton is expanding its Scouting population one youth at a time. This year alone, the 1st Riverview Group has grown by over 43% fulltime youth members. To uncover how this growth occurred, ScoutScene chatted with Group Commissioner, Darryl Tozer, to hear more about his Group’s story. “What do I love about Riverview Scouting? It’s so easy to sell!” This is how Darryl Tozer started a letter addressed to Scouters and Group members. The Group’s recent success prompted Darryl to write a letter to his Volunteers thanking them for their dedication. Perhaps it is little niceties like this that keep Darryl’s Group morale up and numbers climbing. In his letter Darryl talked about four key areas that allowed his Group to grow. Programming was his number one reason for Group Growth. “We are doing things we’ve never done before, including more camps on all levels.” For Darryl, his Group is all about Youth-led. Darryl always chats with his youth on planning their activities for the year and clearly they all love camp! We are doing things we’ve never done before, including more camps on all levels. Dedicated members is also a key area that Darryl focuses on. 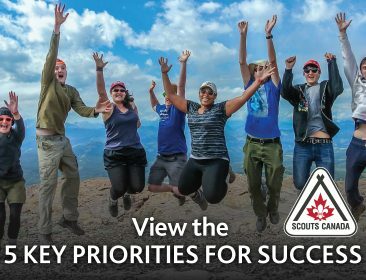 He states that, “Scouters, Group Committee members and parent helpers that provide support ensure the success of our programs.” Darryl emphasizes that their commitment and passion for Scouting is the reason why the youth come back. Retention is the other area that Darryl attributes to his Group’s growth. “We are seeing more members than ever returning on a yearly basis… I think our linking of Sections together last year proved way more than beneficial than ever thought.” Darryl went on to explain that the Cub Pack brought in a Patrol Leader from Scouts and the Cub Scouts loved him – they even copied everything he did (including tucking in their shirts). It is clear that the 1st Riverview Group understands that retention is just as important as growth. For Darryl, linking is a great way to show younger Sections that Scouting has great things to offer in the more senior Sections as well. Lastly, the 1st Riverview Group believes that exposure in the community is key to growth. Darryl explains that, “working with the Lions Club and Town of Riverview we are getting opportunities to show Scouting is still alive and very much kicking.” From working at the Veterans Dinner on Remembrance Day to working with the fire department, the 1st Riverview Scouting Group is very active in their community and they are being noticed.